Erin Blegen: My Scrap Cabin: Design Team Member for PaperHaus~!! Good morning everyone! It's the Memorial Day Holiday Weekend in my part of the world and my sister Kelly is up visiting with the kids so we are quite busy! However, I just had to come on and share with you all that I've been invited to join the PaperHaus Design Team~! 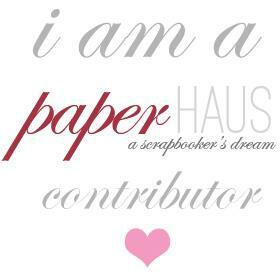 PaperHaus is a quarterly publication that is always packed full of inspiration, articles,and tutorials from all walks and styles of crafting from artists all over the world. Their blog offers daily posts for your viewing pleasure as well- so if you haven't yet been there, check them out! A special thank-you to Frank Garcia and Trina McClune for the invite :)~ I cannot wait to get started :)~! Well done Erin, very well deserved!!! Have a great Memorial Day weekend! Congratulations, Erin! Love Paper Haus! Have a wonderful weekend. Awesome, and AMAZING! So deserved! And have a wonderful weekend with Kelly! Congrats Erin! How Exciting! You deserve it! Have a great holiday weekend with the family! Woohoot, that is awesome news! Big congrats! Big Congrats Erin!! Hope you guys have a fun visit, while Kelly is there!! Congrats to you Erin!! WTG!! Big congrats to you, I will hop over to their site , look your introduction! That's fantastic Erin!! I will go & check it out, another Company of goodies I can get to know, yay!